Here at Red Rose Cabinetry, we strive to help our customers avoid “remodeler’s remorse” and love their kitchens, bathrooms, and, especially, their cabinets. These are the design trends we’re loving right now! Even here in Lancaster County, home to Amish-crafted and traditional farmhouse styles in cabinetry and other furniture, contemporary designs have become more popular and desirable. Think more streamlined, “modern” profiles with less ornamentation overall. Lots of straight lines, confident angles, frameless mirrors (like in our main image above), and an emphasis on clean simplicity. Of course, the term “transitional” refers to a mix of modern styling with more traditional, timeless elements like rustic bead board, crown moldings, and fanciful light fixtures. Did you know that the majority of finishes ordered by our Red Rose Cabinetry customers right now are painted, not stained or natural wood? Gray and darker colors are popular, though clean white or off-white painted cabinets continue to generate enthusiasm among remodelers. As we touched on in our previous post here on the blog, painted cabinetry is prized for its ability to provide a fresh look and feel. It’s also easy to care for, and future updates may be as easy as repainting instead of replacing. It’s true that the minimalism movement continues to inspire us to rethink our use of space in our homes (we’re abandoning “McMansions” for Tiny Houses and have embraced “tidying up” as a joyful pastime). 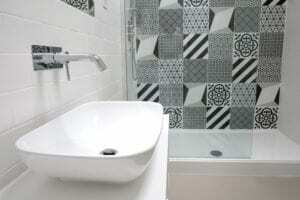 As a result, bathrooms are getting smaller with more efficient layouts. 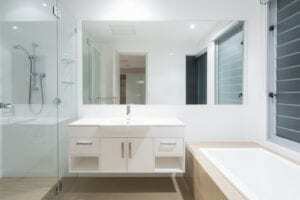 Gone are the cavernous rooms with tons of unused square footage between the tub, toilet, and vanity. We want more of our bathroom space to be useful space, and that means smarter storage options and overall user-friendly design. You read that correctly. We want tech in our toilets in 2018! As all of our appliances and household fixtures are becoming “smart” and optimized for better human comfort and convenience, so too is the humble toilet. Available with options including heated and motion-activated seats, as well as different flush choices to save water, these new, so-called “super toilets” are revolutionizing all those necessary trips to the bathroom. 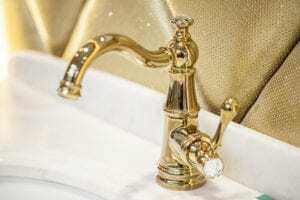 Remember all of those brass and gold fixtures and cabinet hardware that were all the rage in the 1970s and 1980s? Well, as with all trends, these warmer-toned metals are replacing the brushed nickel and silver-toned finishes we’ve been seeing in recent years. And they’re making their ways onto walls and other accents, too. Dark, oil-rubbed bronze finishes are also on the wane in favor of these richer tones that pair well with light-colored marbles, which are common now on countertops. 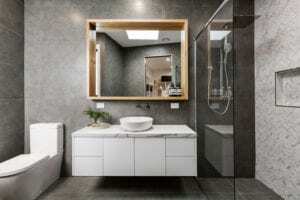 One of the themes in 2018 bathroom trends is an emphasis on creature comforts, and heated floors, once common in only high-end homes, are an affordable upgrade now. Electric mats installed under tile are easily controlled via a thermostat on the wall and can help save energy while creating a more comfortable daily showering/bathing experience. According to HGTV, heated floors can be set to a lower temperature than forced air heating systems, as well, because it doesn’t take much warmth on your feet to warm your entire body. And these heating systems may help you reduce your central heating use since they can often fully heat smaller bathrooms on their own. The rectangular symmetry of subway tile on bathroom walls is on its way out. Now, unique shapes like honeycomb and chevron are popular. And mixing tile shapes and styles is also a current “do.” Plank-style tiles on floors pair with other shapes on walls to create a patchwork quilt scheme that lends visual interest. And we can’t forget about graphic tiles! These tiles, featuring painted or patterned designs, are also everywhere right now. Floating vanities are wall-mounted to give the illusion that they are suspended in the air instead of attached to the floor. The appeal is that these pieces have less visual weight overall, and they lend a more open and airy feel to the entire space. While these vanities present some engineering challenges and are not perfect for every bathroom, they offer unique customization options that traditional vanities do not. For instance, you can add bin or basket storage beneath the vanity, or you can install lighting to the underside to illuminate the floor beneath (makes a great nightlight)! If you have noticed already, in addition to a focus on creature comforts, this year’s hottest bathroom trends also emphasize open space. Cabinet doors have been removed, and a lot of open shelving has taken the place of closed-off storage units. This is good news for those neat and organized folks among us who would ultimately like to live in a hotel. However, while open shelves can be visually appealing, we still recommend plenty of closed storage spaces in the bathroom, as well! Our criteria for calling out these questionable trends are based on expense and overall commitment. These are expensive to refresh in the future and are likely to fall out of style quickly. While you probably have hardwood floors in other areas of your home, many experienced designers will steer you into considering other flooring for your bathroom. Why? Well, many kinds of wood used in flooring will warp next to a shower or bathtub if not properly dried. This gets tedious very quickly – especially if you have splash-happy kids using the bathroom on a regular basis. In fact, just the extra moisture in the air in most bathrooms can cause wood flooring to swell and buckle over time, which will necessitate replacement. The good news for hardwood enthusiasts is that lots of “wood-look” plank tiles and new “luxury vinyl” flooring options are available. You can achieve your desired look, sometimes for quite a bit less money, with the added bonus of extreme durability in wet environments. Remember the pink toilet, tub, and sink in your parents’ 1960s ranch house bathroom? Color-coordinated porcelain fixtures were all the rage in the mid-20th century, and with some of those modern-style trends roaring back to popularity, we’ve recently seen manufacturers cautiously bringing color back in these utilitarian objects. We recommend caution in adding these to your new bathroom, as well. One of the main reasons? These fixtures are considered semi-permanent, and as such, they are expensive to change out. If you’re considering selling your home in the next decade, or you just change your mind about your home’s decorating schemes frequently, opt for basic white, which is understated and easy to match. Ready to make your remodeling dreams a reality? We invite you to check out our inspiration gallery for more great ideas on trends you might want to incorporate into your bathroom renovation plan. Or, stop in and visit our showroom to find out how we bring your remodeling dreams to life!